I'm up 7 but my opponent has Redskins D.
I hope we win tonight 52-49. Things were looking BAD for my team when I last posted, but 77.8 points from Mahomes and Keenan Allen worked wonders. I wonder what percentage of fantasy teams nationwide that have Gurley will make the playoffs? Dude's the most consistent fantasy player in years. Same with kamara and AB. Having a top 3 draft pick makes a world of difference. Not if you pick DJ at 3. Kamara has dropped off too. That said, Gurley or Mahomes probably single handedly made people playoff teams. I have him on 4 teams (2 Dynasty) and only 1 will make the playoffs (Gronk in the 3rd was my biggest mistake this year followed by Fitzgerald in the 6th). Looking back, I picked up Patrick Mahomes in Round TEN of our 12-team Fantasy draft. I had picked up DeShaun Watson in Round 2 and assumed he would be my starter all year. It took me a couple of weeks to realize Mahomes was the real deal. Ok I have the opportunity to be absolutely ruthless and I can pick my playoff week one opponent (By benching or not benching Jeffery) Seed 3 versus seed 6. Top scorer in my league has Mahomes saquon McCaffrey and thielen. He is missing the playoffs. Nevermind. AP'S 90yd run caused the 6th seed to swap to the above guy due to a points tiebreaker.. I'll be playing him round one. Ugh. OK guys ruthless or a good sport? - need your input from 2 posts above. Definitely a weak move, but judging by those two teams, I don't even think it'll matter. Neither of those teams look especially intimidating. Just play Jeffrey for good karma and go with whatever happens. Well, my team of misfits lost. Fortunately plan B succeeded wherein the teams I needed to lose did, so I nabbed the final playoff spot. The penultimate week of the regular season was NOT the week to put up my loweat points total of the year resulting in my heavieat defeat of the season by far. (85.76- 151.70.). 9- 4. 9 W’s down. 3 to go! 1 more win or we might not go!!!!! ALL to play for in the ES League going into the final week with all 4 paloff slots up for grabs. Well as you know from when you politely got told to do one with the Kamara trade offer mid-season, ; I specifiaclly targeted Kamara and Thielen as my top RB/ WR want going into the draft and fortunately I was lucky enough to have bagged them both with my first two picks. Although in retrospect had I been drafting first and not 7th, taking Kamara as I defo would have over Gurley would have been the wrong play. Not a bad one by any means in our flat out PPR. But the wrong one regardless. Welp, six years in the ES league, I missed the playoffs for the first time. 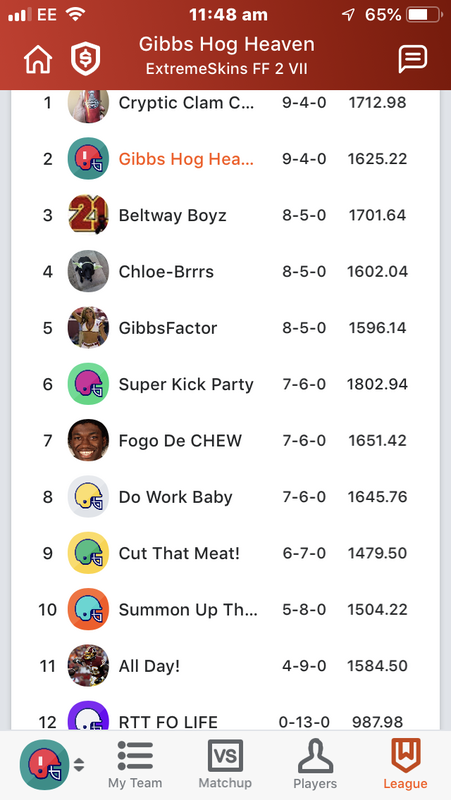 I outscored three of the six people who made the playoffs......but with fantasy, it's all about the points against, and I'm top 3 with most points scored against me. Made the playoffs in both my money leagues, which is cool. But I love the trash talk in the ES league. I've basically clinched the #1 seed in my league with one regular season game left. Only four teams make the playoffs and top 3 get money so I'm sitting pretty good at least from a financial standpoint. Chose Option 2 - ruthless , since Brieda was injured and his WRs have harder match-ups. When you have Gronk, make a claim for Jaylen Samuels (TE/RB designation in Yahoo), and your opponent has James Connor and has a higher priority than you. Then you wake up early and see he took Jalen Richard. David Johnson (vs Lions) or Tyler Boyd (vs Chargers) at Flex in a 1pt PPR? Already starting Boyd's teammate Joe Mixon if that makes a difference. That's gotta be David Johnson at home. For points allowed by position, the Lions D gives em up to RBs, and the Chargers are don't to WR's. You have a gut feeling or something here, or maybe just traumatized from David Johnson's season? So someone who is completely out of everything just released Robert Woods. With Emmanuel Sanders goingI could clearly use him but I have no waiver wire money left. Should I raise hell if someone gets him? There was no readon for him to release him and he picked up no on else? If his brother who is in the playoffs or anyone else in the playoffs gets him should I go crazy. Lol. Woods would be a nice # 2 next to Theilen on my team. I guess we’ll find out in the warly am tomorrow. Gave my team a little make-over for the first week of playoffs. Picked up Mitch Trubisky, Zay Jones, and Jaylen Samuels. Not a Yahoo league, so Samuels is playing Flex to replace Kareem Hunt. If everything goes well, I may be able to eek out a loss of only 10 points. Pretty fishy, IMO. Teams that don't make the playoffs should have their rosters locked.